Structural Adhesive Market Size - Segmented by Resin Type (Epoxy, Polyurethane, Acrylic, Cyanoacrylate), End-user Industry (Construction, Automotive, Aerospace, Wind Energy), and Geography - Growth, Trends, and Forecast (2019 - 2024). The global structural adhesive market is expected to register a CAGR of approximately 7.3% during 2018-2023 (the forecast period). The increasing demand for structural adhesives from the construction and automotive sectors is expected to boost market growth. In addition, increasing investments in the developing regions of Asia-Pacific are expected to drive the market. 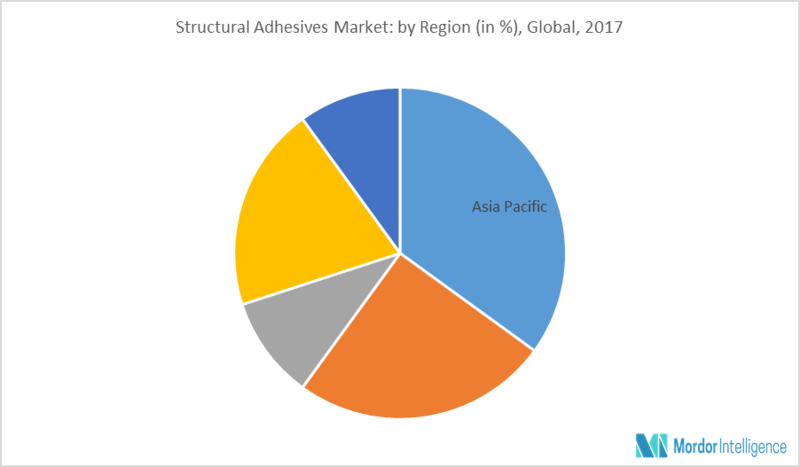 The major driver for the structural adhesives market is the increase in investment in the developing economies of Asia-Pacific in various end-user industries, like construction, automotive, wind, etc. Countries, like India and ASEAN, are showing an increase in private investment, along with government policies to uplift the local adhesives producers, and helping them increase their base overseas, thereby, driving the market studied. The market is segmented on the basis of resin type and end-user industry. Based on resin type, epoxy has high demand, mainly due to their excellent intrinsic properties, like resistance to chemicals, low shrinkage values, and low VOC release during curing. Also, their usage has been increased in various niche applications, where excellent bonding strength is required. Based on the end-user industry, construction is the largest end user and is expected to dominate the market during the forecast period, as a result of the increasing construction activities in China, India, etc. Asia-Pacific is the largest market for structural adhesives and is expected to increase in the forecast period, due to the demand from economies, like India, China, Japan, South Korea, etc., due to the increasing investments in end-users industries, such as construction, automotive, aerospace, etc. Also, significant shipbuilding activities in China and Korea are also expected to drive the demand in the Asia-Pacific region. In addition, factors, like urbanization and rising per capita income in these countries, have also bolstered the growth. October 2017: H B Fuller has completed the acquisition of Royal Adhesives & Sealants for USD 1.575 billion. Hubei Huitian Adhesive Enterprise Co.